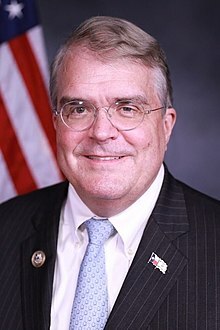 <<John Abney Culberson (born August 24, 1956) is an American attorney and politician who has served as the U.S. Representative for Texas's 7th congressional district since 2001. He is a member of the Republican Party. The district takes in large portions of western Houston and surrounding Harris County. Culberson rejects the scientific consensus on climate change. He has alleged that scientists have falsified climate change data. He has said that "the liberal obsession with climate change... is driven by their desire to raise more money for the government". He opposes cap-and-trade programs and the federal regulation of greenhouse gas emissions. As of April 2018, he had voted with his party in 97.6% of votes so far in the current session of Congress and voted in line with President Trump's position in 98.6% of the votes.Culberson voted against a resolution that would have directed the House to request 10 years of Trump's tax returns, which would then have been reviewed by the House Ways and Means Committee in a closed session. He supports the construction of a wall along the Mexican border, and supports requiring immigrants who are unlawfully present to return to their country of origin before they are eligible for citizenship. Culberson supported President Donald Trump's 2017 executive order to suspend the refugee resettlement program and curtail immigration from seven Muslim-majority countries. He stated that "This is a necessary pause in the refugee program until our intelligence agencies can develop adequate background checks to ensure that the people coming into the country are coming in for the right reasons." In 2016, Culberson wrote a letter to Attorney General Loretta Lynch threatening to block President Obama's executive order on guns by defunding the United States Department of Justice. Culberson opposes the Patient Protection and Affordable Care Act (Obamacare) and supports it repeal. On May 4, 2017, Culberson voted to repeal Obamacare and pass the American Health Care Act of 2017. The AHCA would have allowed insurers to charge seniors five times as much for health coverage than younger people (the ACA limit was three times as much) and allowed insurers to raise premiums on individuals with preexisting conditions who did not have continuous coverage. In 2013, Culberson said "like 9/11, 'let's roll!'" to describe a vote to make a delay of the Patient Protection and Affordable Care Act a condition for funding the government. In 2009, Culberson co-sponsored legislation which would require all future presidential candidates to provide proof of their citizenship when filing to run for office. The legislation was in response to Barack Obama citizenship conspiracy theories which questioned the legitimacy of Barack Obama's birth certificate. Culberson marked up a 2016 spending bill to include a requirement that the National Science Foundation direct about 70% of its funding to biology, computing, engineering, and math and physical sciences. The earmarked funds would not cover geoscience and the social and behavioral sciences.